Alcoholic beverage word association, quickly: "France?" Of course you said "Wine". Good beer is available in France, just not in the variety that an Oregon beer geek has come to demand, and not piled high in every restaurant, diner, and convenience store the way good wine is. After a week in the Loire Valley and Paris, I'm delirious with joy if a bar has Affligem Blond on tap instead of the ubiquitous and somewhat cloying Leffe Blonde; in the supermarket the best option tends to be Hoegaarden tall-boys, though I did drink a couple Kronenbourgs to support the local team. 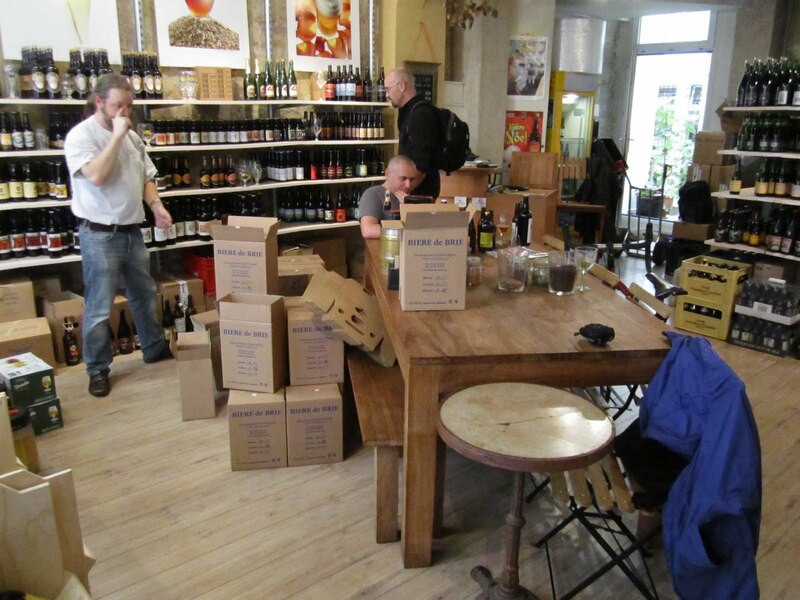 Luckily, our Paris lodgings were a five-minute walk from the showcase beer store in the City of Light: La cave à bulles -- translation: The Suds Cellar -- at 45 Rue Quincampoix, around the corner from the Centre Pompidou. It's stocked with a few hundred varieties of beer, and might remind you somewhat of the original Belmont Station location. The focus is fittingly on French beer, though there is a good selection of Belgians, and even a few Sierra Nevada and Left Hand bottles tucked away. The Belgian selection is less than what is available in Portland at Beermongers or Belmont, but la Cave did have a few Cantillons on the shelf, which hasn't been available in Oregon recently ($8 for 375 ml). The proprietor, Simon Thillou, is very welcoming, and gives personal attention to each customer that walks in, to try and guide them in their beer selection. I watched him work with an older couple who came in to look for a bottle to impress a beer loving friend: "Do you want something stronger or less so? Darker or lighter? Sweeter or drier? How bitter?" They were beer novices, and balked a little at "bitter". "But you drink coffee, you eat chocolate, don't you? It's not bitter in a bad way." He's equally adept at working with a picky beer geek, starting with a few questions about what you like, and branching out with some choices to help you explore the French beer scene. His English is probably better than your French, so don't hesitate to ask questions. Most of the bottles are sold at room temperature, though a small number are kept refrigerated, if you're in a big hurry to get some beer down your throat. Prices are reasonable, considering a central Paris location: generally about $4.25 for 33 cl bottles, or $8.50 for 750 ml. Big bottles of Cantillon Iris were on the shelf for $19, and if you're homesick, drop €6.10 for a Ninkasi IPA -- oh, wait, that's the French Ninkasi in Lyon, which predates the Oregon one. La cave à bulles is open Tuesday through Saturday, 10 AM to 2 PM, and 4 PM to 8 PM (but not Wednesday mornings). I only got to make one visit to the Cave à bulles, because the store is closed Sunday and Monday, we arrived in Paris in a downpour Saturday evening after it was closed, and we left town Wednesday morning before it opened. I'm glad I finally made it there, and I highly recommend it to you if you're visiting Paris. I am most envious of your travels. What French bieres have you tried and enjoyed? Funny the guy who started the Lyons Ninkasi is from Portland.